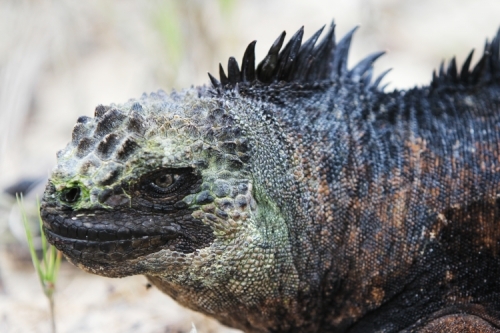 Marine iguana populations in the Galápagos Islands decrease during El Niño events. The oceanographic climate phenomenon brings warmer waters to the islands, causing the the marine food supply to diminish. UNC researchers are looking at the productivity levels of Galápagos waters to learn more about the severity of this year’s El Niño. Some of the planet’s tiniest organisms are visible from space. Phytoplankton — single-celled, water-dwelling algae — are one-millionth of a meter in size and produce about 50 percent of the oxygen we breathe. These microscopic oxygen factories inhabit the sunlit portion of the world’s oceans, supplying nourishment for much larger organisms and valuable information for scientists. Millions of phytoplankton swirl around in jugs of seawater, collected just moments before from the Equatorial Pacific Ocean. Adrian Marchetti filters the water in his makeshift lab — an old garden shed on the Sierra Negra. This Galápagos National Park Service vessel is typically used to monitor the waters surrounding the islands. 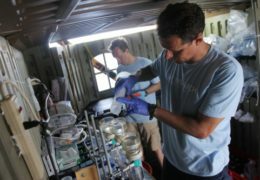 “These vessels don’t have the equipment we usually use to do our work, so we had to improvise,” Marchetti, a UNC-Chapel Hill oceanographer, says with a laugh. 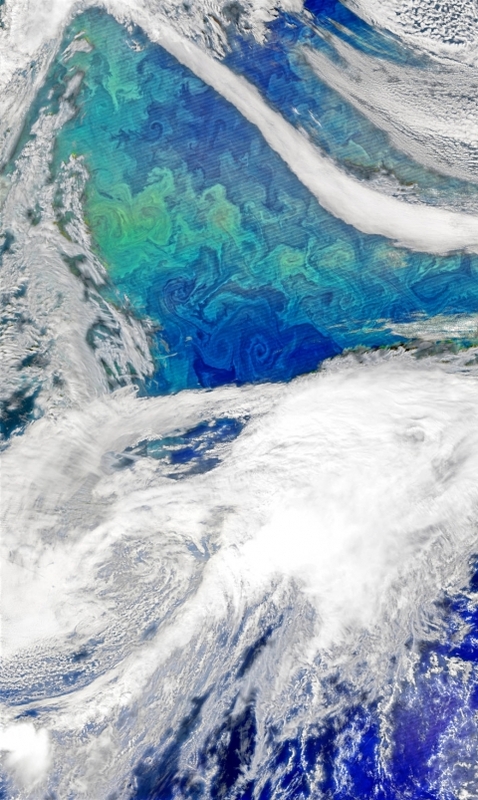 NASA has unveiled a satellite photo showing a phytoplankton bloom in the North Atlantic, taken in late September. Scientists call this process the “microbial loop,” and Marchetti and Gifford are particularly interested in this one because the waters surrounding the Galápagos are warmer than normal. El Niño has arrived. Every five to eight years, this climate anomaly throws the islands off balance for 12 to 15 months. Phytoplankton decrease, causing a disruption in the food supply. Small fish that eat the phytoplankton die off, and that cascades up the food chain. A surplus of rain boosts the terrestrial environment; land plants grow like wildfire and the bird populations become overwhelming. 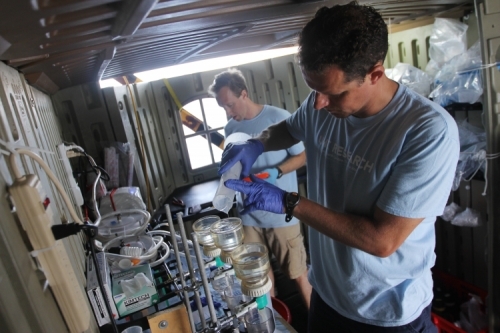 UNC oceanographers Adrian Marchetti and Scott Gifford filter water samples just collected from the Equatorial Pacific in a garden shed on the Sierra Negra, a Galápagos National Park Service vessel. On the ship deck, Marchetti squints as the Galápagos sun sets over the Pacific. He lifts a round, plastic sampling device — called a Niskin bottle — and connects it to a long steel cable attached to the ship. He flashes a thumbs down at Gifford, signaling the device is ready to go into the water. Using a simple cable-and-weight system, the bottle drops to various depths, collecting slightly different samples of water to compare the diversity, growth characteristics, and interactions of the phytoplankton and bacterial communities (called the marine microbiome) at those depths. Phytoplankton growth depends on available sunlight, temperature, and nutrient levels — the Galápagos Archipelago houses some of the most nutrient-rich waters on the planet. El Niño is strong this year — predicted to be one of the strongest on record. Parts of the Pacific are hotter than ever recorded in the last 25 years, according to the National Oceanic and Atmospheric Administration’s Climate Prediction Center. So it’s important, more than ever perhaps, that researchers gain information from these events to help them predict what’s going to happen as the earth continues to warm. Phytoplankton play a crucial role in the oceanic carbon cycle. Through photosynthesis, they pull carbon from the atmosphere into the deep sea and give off oxygen. Heterotrophic bacteria, on the other hand, consume carbon. The balance between phytoplankton and bacteria is a critical factor for regulating the carbon cycle, which, in turn, affects the planet’s temperature. Gifford measures the rate at which these microbes take up oxygen to figure out how much carbon they consume. Researchers from the Universidad San Francisco de Quito (USFQ) examined sea lions, seaweed, sea turtles, and iguanas. Investigators from the Galápagos Science Center — a collaboration between Carolina and USFQ — also studied the rate of ingested plastics in marine animals and birds through collecting plastics and taking samples from various species around the islands. Six staff members from the Galápagos National Park Service also joined the expedition to observe iguanas and search for insects that may have been introduced to the islands. Both Marchetti and Gifford hope to return in the spring, during El Niño’s peak, to collect more samples — and, ideally, again in the future to observe the La Niña event, which typically follows an El Niño and results in cooler-than-normal water temperatures around the islands. “We want to learn how it will influence organisms in other parts of the ocean, and how we can use this information to help manage and protect the Galápagos National Park,” Marchetti says. Adrian Marchetti is an assistant professor in the Department of Marine Sciences at UNC-Chapel Hill. Scott Gifford is an assistant professor in the Department of Marine Sciences at UNC-Chapel Hill and the Sewell Family Foundation Fellow. To contact Gifford or for more information on his research, follow @giffsm on Twitter. The Galápagos Science Center, located on Isla San Cristobal, is a joint effort between UNC-Chapel Hill and the Universidad San Francisco de Quito in Ecuador. The goal of the center is to promote science and education that will help protect the fragile island ecosystems of the Galápagos and enhance the lives of their inhabitants.